BARNABY RUDGE. A Tale of the Riots of Eighty. Barnaby Rudge. By Charles Dickens. (Boz.) With ... illustrations from designs by George Cattermole and H. K. Browne. Vol. 2. BARNABY RUDGE; A TALE OF THE RIOTS OF 'EIGHTY. 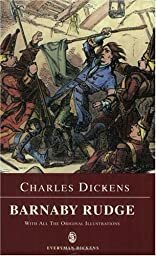 Barnaby Rudge, a Tale of the Riots of "Eighty"
BARNABY RUDGE: A TALE OF THE RIOTS OF 'EIGHTY'. BARNABY RUDGE; A Tale of the Riots of 'Eighty. Complete in One Volume. Published in 1841 as part of MASTER HUMPHREY'S CLOCK,the journal founded by Dickens,BARNABY RUDGE is the earlier of Dickens's two historical novels(the other being A TALE OF TWO CITIES).It is set in the period of the Gordon anti-popery riotof 1780 and contains powerful evocations of mob violence,culminating in the sackof Newgate.The main story is a romantic one about the troubled love affair of Emma Haredale,whose father has been mysteriously murdered,and Edward Chester,sonof Sir John Chester,a villain who helps to instigate the riots. About Donald Hawes (Editor) : Donald Hawes is a published editor. A published credit of Donald Hawes is Barnaby Rudge: A Tale of the Riots of 'Eighty (Everyman's Library (Paper)).